PHOTO BY JILL GOSCHE Tiffin Fire Rescue Division and Tiffin Police Department personnel tend to James D. Pennington at 97 Jackson St. Saturday night. A standoff between a man accused of making homicidal and suicidal threats and Tiffin Police Department ended peacefully Saturday night. James D. Pennington, 54, was taken into custody at his residence at 97 Jackson St. about 8:35 p.m., about two and a half hours after the standoff started, according to Tiffin Police Department. Sgt. Jake DeMonte said Pennington had indicated he would try to kill anyone who tried to approach. DeMonte said that during the standoff, Pennington allegedly came out wielding a sword with five blades and threatened to stab officers. “It’s on,” DeMonte recalled him saying. 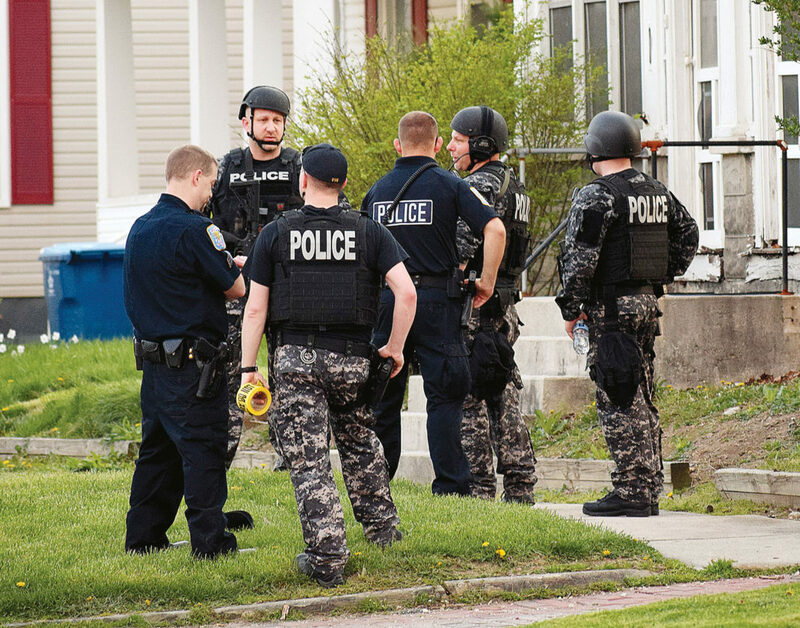 PHOTO BY JILL GOSCHE Tiffin Police Department officers work at the scene of a standoff at 97 Jackson St. Saturday evening. 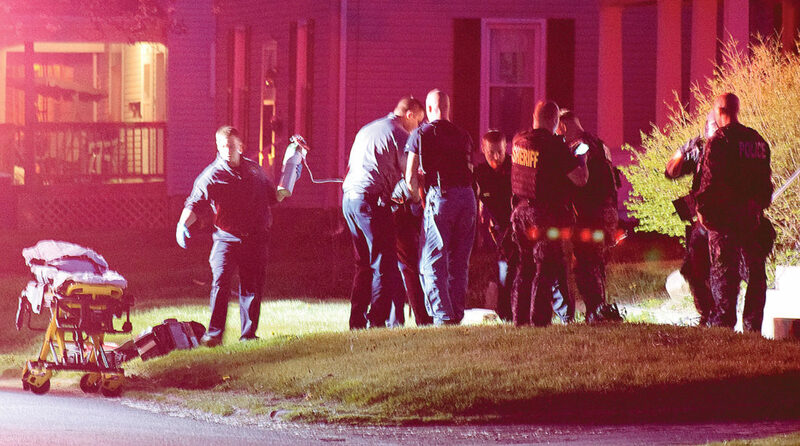 An officer shot him with a Taser, according to Tiffin Police Department. DeMonte said Pennington was able to get away after being shot with the Taser, retreated back into the upstairs bedroom and shut the door. Officers had him confined to one room, he said. “We’re in the house,” he said. DeMonte said Pennington allegedly threatened to throw a hand grenade out a door at negotiators. Gas was deployed into the room where Pennington was barricaded about 8:15 p.m. After a short time, he wanted to turn himself in, and he was taken into custody without no additional force used, DeMonte said. Officers had been in the process of deploying a secondary phone to talk to him but it was not used because he already had surrendered. Pennington was treated by Tiffin Fire Rescue Division personnel, who had been on standby down the street during the standoff, for gas exposure. An ambulance then took him to Mercy Health – Tiffin Hospital. He still was resisting arrest in the ambulance, and additional officers were called to the hospital, DeMonte said. Sgt. Jared Watson said once Pennington was cleared at the hospital, he would be held at Seneca County Jail pending a mental health evaluation by Firelands Counseling and Recovery Services. No charges had been filed as of 10:30 p.m. Saturday. No officers were hurt in the standoff, DeMonte said. The city of Tiffin’s street department assisted with closing Jackson Street during the standoff.